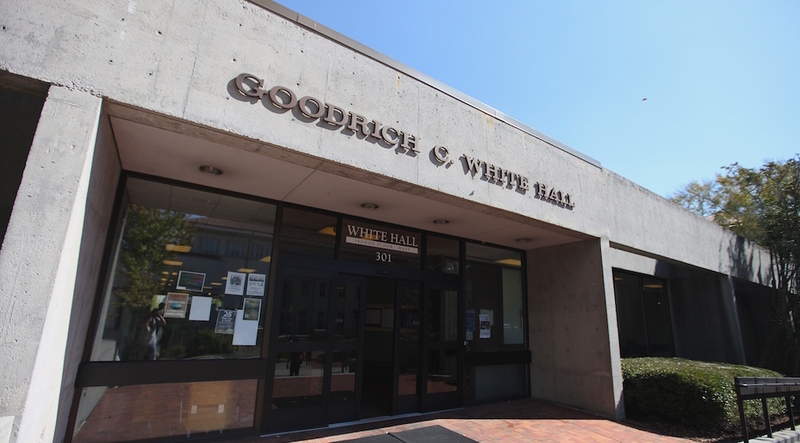 The University is planning major renovations to Goodrich C. White Hall, which could include redesigned classrooms and increased handicap accessibility, according to Facilities Project Administrator Dwight Raby. The renovations, which might commence as early as Summer 2019, may also address deferred maintenance and sustainability improvements. A feasibility study is exploring design options to renovate the building, which has not undergone significant changes since its construction in 1977. The study is exploring what renovations the current structure of the building could support, as well as the logistics of planning and construction. Construction could begin as early as Summer 2019, but will likely begin in 2020, Raby said. The project has a base-level budget of $13 million to $14 million, with the possibility that the project will receive more funding later. “The initial budgeted amount will get us a lot done, but it will be tough to address the entire building,” Raby said. Renovation planning began two-and-a-half years ago with a space study that concluded White Hall was in need of renovation “if it is to support our teaching efforts going forward,” Raby said. One of the main goals of the renovation is to modernize classrooms. “The way we teach now and the way we would like to teach in the future is much different than the way we taught 40 years ago,” Raby said. Flat floor plans that would better facilitate collaboration among students would replace the building’s current tiered lecture classrooms, according to Raby. Raby said the College will send out surveys to students and faculty in the next few weeks to gain input on what features they would like to see in their classrooms in the future. The renovations will also address deferred maintenance and sustainability concerns of the building, much of which is related to the heating, ventilation, and air conditioning (HVAC) system. The feasibility study will examine how the HVAC system may be optimized to accommodate for the building’s busiest hours, which are 10 a.m. to 2 p.m., according to Raby. The project will be completed in phases so the building can be used during construction, Raby said. Emory hired New Orleans-based architecture firm Eskew+Dumez+Ripple to conduct the study. The University held a town hall meeting on April 20 to gain input from about a dozen faculty members, staff and students on what they would like to see in new White Hall classrooms. Raby said there will be opportunities for more input from the Emory community in future meetings. Raby sent a May 14 email to Emory students with a link to a survey to gauge students’ opinions of White Hall. The survey asked questions about which entrance students used most often, which classroom styles they preferred, windows in classrooms, study spaces and dining options.